The “paraglacial” and “paraperiglacial” concepts were introduced in the second half of 20th Century for describe processes, landforms and deposits directly conditioned by deglaciation (paraglacial), respectively by permafrost degradation (paraperiglacial). They represents theoretical models describing the transition from glacial to periglacial, or more generally non glacial conditions (paraglacial model), and from periglacial to temperate conditions (paraperiglacial model). Evidences of sediment transfer conditioned by these processes were described in particular in the Arctic and Subarctic domains. These evidences are less generalised in the Alps and they consider rarely both concepts, integrating periglacial landforms and deposits in source to sink sediment transfer in a single catchment. Here we present evidences of para(peri)glacial sedimentary crises by quantifying sediment transfer from the periglacial zone to the delta in Lake Maggiore for the Ticino River catchment (southern Swiss Alps). Compilation and revision of chronological data, the assessment of sedimentation rates in the Ticino Valley, of progradation rates of the Ticino River delta and of rockwall erosion rates in the periglacial zone, allowed empirical models of sediment transfer to be produced. These models highlights significant high sedimentation rates in the valley floor during the beginning of the deglaciation, and significant rates of rockwall erosion during periods of intense temperature warming and intense permafrost degradation (such as at the beginning of Bølling and during the Preboreal), showing a very good correspondence with paraglacial and paraperiglacial theoretical models. Sediment transfer evolution during the entire Lateglacial and the first half of Holocene in the southern Swiss Alps may then be explained by a combination of a paraglacial erosion phase related to the deglaciation and of two paraperiglacial erosion phases related with significant periods of temperature warming during the Bølling/Allerød and the first part of the Holocene. Les concepts de “paraglaciaire” et de “parapériglaciaire” ont été introduits dans la deuxième moitié du 20e siècle pour décrire les processus, les formes et les dépôts directement conditionnés respectivement par une déglaciation (paraglaciaire) et par la dégradation du pergélisol (parapériglaciaire). Ils représentent des modèles théoriques décrivant la transition de conditions glaciaires à périglaciaires, ou plus généralement non glaciaires (modèle paraglaciaire), et de conditions périglaciaires à tempérées (modèle parapériglaciaire). Des évidences de transfert sédimentaire conditionné par ces processus ont été décrites surtout dans les domaines Arctique et Subarctique. Ces évidences sont beaucoup moins généralisées dans les Alpes et tiennent rarement compte des deux concepts, en intégrant les formes et dépôts périglaciaires dans l’évaluation du transfert sédimentaire de la source aux bassins de sédimentation pour un seul bassin versant. Sont présentées ici les évidences de crises sédimentaires para(péri)glaciaires en quantifiant le transfert sédimentaire de la zone périglaciaire jusqu’au delta dans le Lac Majeur pour le bassin versant du Ticino (sud des Alpes Suisses). La compilation et révision de données chronologiques, la quantification des taux de sédimentation dans la Vallée du Ticino, des taux de progradation du delta du Ticino et des taux d’éboulisation dans la zone périglaciaires, ont permis de présenter des modèles empiriques du transfert sédimentaire. Ces modèles mettent en évidence des taux de sédimentation significativement très hauts dans le fond de vallée au début de la déglaciation, et des taux d’éboulisation significatifs pendant les périodes de réchauffement des températures (comme au début du Bølling et pendant le Preboréal), montrant une très bonne correspondance avec les modèles théoriques de sédimentation paraglaciaire et parapériglaciaire. L’évolution du transfert sédimentaire pendant tout le Tardiglaciaire et la première moitié de l’Holocène au Sud des Alpes Suisses peut donc être expliquée par la combinaison d’une phase d’érosion paraglaciaire liée à la déglaciation et de deux phases d’érosion parapériglaciaire liées avec les périodes de réchauffement climatique significatif pendant le Bølling/Allerød et la première partie de l’Holocène. 5 - An empirical evidence of paraglacial and paraperiglacial crisis? A part of researches carried out on the infilling of Ticino Valley were funded by Fondazione Bolle di Magadino, in collaboration with the Parco botanico del Cantone Ticino delle Isole di Brissago and Stump ForaTec SA, in the framework of the project “Deep Seed”. SHD on periglacial landforms was funded by University of Lausanne. A special thanks to Magali Delmas and another anonymous reviewer for their useful feedback. 1The concept of “paraglacial” was first introduced for defining both all non-glacial processes directly conditioned by glaciation, and the period during these processes are active (Church & Ryder, 1972). This definition was then generalised to all sedimentary accumulations, landforms, geosystems and landscapes directly conditioned by glaciations and deglaciations (Ballantyne, 2002). The theoretical paraglacial model describes the transition from a glacial to a periglacial, or more generally a non glacial, morphogenetic system (Thorn & Lowenherz, 1987; Slaymaker, 2009), both considered in a steady regime, and is characterised by a paraglacial morphogenetic crisis related to the energetically re-equilibrium of the system as the consequence of a deglaciation. The real existence of paraglacial processes is nevertheless doubt, because this implies that pure paraglacial landforms, neither related to glacial or periglacial processes, must to be recognized (André, 2009). 2By analogy with the paraglacial morphogenetic crisis, the concept of paraperiglacial morphogenetic crisis was also proposed for defining the equilibrium transition from a periglacial morphogenetic system to a temperate one (Mercier, 2008; Scapozza, 2013a). This concept defines Earth surface processes, sedimentary accumulations, landforms, geosystems and landscapes directly conditioned by permafrost degradation. 3Evidences of sediment transfer conditioned by these processes were described in particular in Arctic (Svalbard, Greenland; e.g. Mercier et al., 2009; Cossart et al., 2013) and Subarctic (Scotland, Norway; e.g. Curry, 2000; Ballantyne, 2008) domains, whereas they are less generalised in the Alpine domain (e.g. Hinderer, 2001; Schrott et al., 2006; Delmas et al., 2009). From one hand, by quantifying rockwall erosion rates based on the volume of periglacial landforms (e.g. Hinchliffe & Ballantyne, 1999; Curry & Morris, 2004), and from the other hand by determining the exposure-age of the landforms (e.g. André, 1997, McCarroll et al., 2001). 4The aim of this study is to present empirical evidences of paraglacial and paraperiglacial crisis in sediment transfer in an Alpine catchment. Evidences presented here come from the Upper Ticino River catchment in southern Swiss Alps (fig. 1). They are based on the joint analysis of three kinds of data: (1) rates of vertical aggradation of Ticino River floodplain and (2) rates of lateral progradation of Ticino River delta, both based on borehole information and historical sources (fig. 2), and allowing an assessment of Ticino Valley infilling since the last glaciation; (3) sediment transfer quantification from rockwalls to rock glaciers and talus slopes in the periglacial zone of the Cima di Gana Bianca massif (fig. 3A). Fig. 1: Location of the Ticino Valley and of the Cima di Gana Bianca massif in the southern Swiss Alps. Position of boreholes GESPOS 701.96 and ATB 123, and of excavation MOL 1, located outside the frame of figure 2. Coordinates: Swiss Grid system CH1903 / LV03. Modified from Scapozza & Ambrosi (2016). Fig. 2: The lower Ticino Valley infilling. 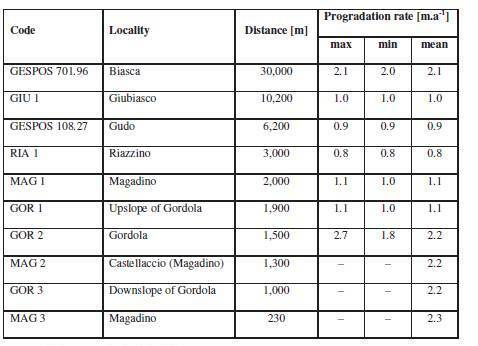 Location of boreholes and excavations with dated material and archaeological findings reported in table 1, historical positions reported in table 2, and bedrock contour lines from Beatrizotti (1985). See figure 1 for geographical location and for the position of boreholes GESPOS 701.96 and ATB 123, and excavation MOL 1. Modified from Scapozza et al. (2012). 1/ Borehole or archaeological finding, 2/ Hydrography, 3/ Fluvio-deltaic deposit. 5The relief of the upper part of Ticino River catchment is characterised by steep slopes, where significant rockwalls, peaks passing 3,000 m a.s.l., the partial lack of vegetation above 2,000 m a.s.l., and the presence of perennial snow and glaciers above 2,800 and 3,000 m a.s.l. (altitude of the equilibrium line of the glaciers, Scapozza & Fontana, 2009), indicates typical Alpine geomorphological conditions. Toward Bellinzona, the valleys widen, significant chestnut forests cover the valley slopes and the climate is more temperate, and becomes almost Mediterranean in proximity of Lake Maggiore (Scapozza & Ambrosi, in press). 6The glacial history of the Ticino Valley since the Last Glacial Maximum (LGM) was reconstructed and described by Scapozza et al. (2014). The regional LGM of the Ticino and Adda glaciers was constrained by radiocarbon dating between 28.50 and 22.90 cal. ka BP. The first recessional stadial upslope of the actual Lake Maggiore basin was the Cugnasco stadial, where the Ticino glacier was a calving glacier on a Lake Maggiore that reached 215-220 m a.s.l., corresponding with the maximal elevation reached by LGM moraine ridges north of Sesto Calende. By correlation of the deglaciation sequence of the Ticino glacier with the Eastern Swiss Alps and with the Greenland isotope record, the Cugnasco stadial was dated between 20.45 and 19.85 cal. ka BP. The Ticino Valley downslope of Biasca was completely ice-free since the glacial stadial following the Cugnasco stadial, named Biasca stadial in the regional morphostratigraphy, and dated ca. 19.85 cal. ka BP). 7A synthesis about the Ticino Valley infilling during the Lateglacial based on reflection seismic profiles, borehole stratigraphy analysis and radiocarbon dating (with the determined ages reported in fig. 4), was proposed by Scapozza et al. (2012). During the Oldest Dryas, the Lake Maggiore probably reached its maximum extension toward Giubiasco–Sementina (fig. 5). Lacustrine deposits identified in several boreholes realised on the valley infilling indicated the presence of several lake basins characterising the Ticino Valley from Biasca to Bellinzona. The northern one is borehole GESPOS 701.96 realised in Biasca, were glaciofluvial deposits characterising the deepest part of the borehole until 236.3 m a.s.l. 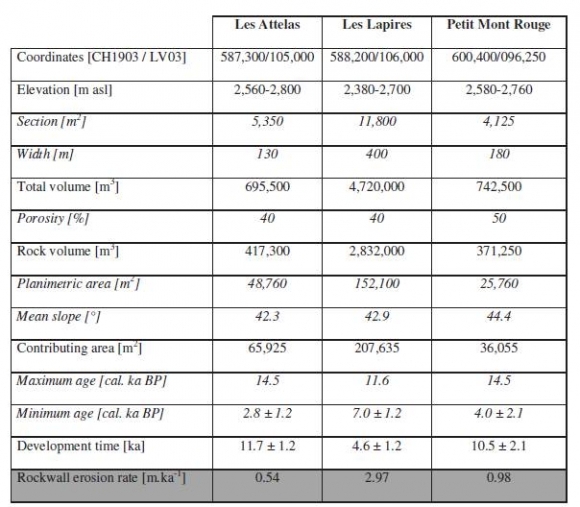 are covered by lacustrine deposits dated at 14.90-14.09 cal. ka BP (12,370 ± 85 BP; UZ-5199/ETH-30382), corresponding with the end of Oldest Dryas (fig. 4). These local lakes would have formed as the consequence of the valley floor dam by the alluvial fans in formation (fig. 5). The complete filling of these lake basins, formed after 19.85 cal. ka BP, predates the Holocene. Organic material of sample GIU 1 in Giubiasco (fig. 2) were dated in fluvial deposits at 10.70-10.44 cal. ka BP (9,355 ± 40 BP; UZ-5958/ETH-42562), indicating that at the beginning of Holocene the Ticino River floodplain already reached S. Antonino (fig. 6). Considering that dating in borehole GESPOS 701.96 realised in Biasca was performed at the top of lacustrine sediments (239 m a.s.l. ), it is probable that complete infilling of local lakes between Biasca and Bellinzona took place before the Younger Dryas, if not before the end of the Oldest Dryas. 8The progradation of the Ticino River delta during the Holocene was recently reconstructed thanks to the characterization of fluvio-deltaic sediments (lacustrine vs. prodelta vs. fluvial sediments), radiocarbon dating, and historical sources (Scapozza et al., 2012; Scapozza & Oppizzi, 2013). Considering dating GIU 1 discussed above, the Ticino River delta during early Holocene (ca. 11.6-9.5 cal. ka BP) was placed between S. Antonino and Cadenazzo, ca. 10 km upslope of its current position (fig. 6). In correspondence with the first inhabitants of the Southern Swiss Alps during the Older Atlantic (ca. 7.0 cal. ka BP), the delta prograded several kilometres, and its front was located between Cadenazzo and Gudo. A third position was reconstructed during the Subboreal (ca. 4.0-3.5 cal. ka BP) between Quartino and Riazzino. The delta progradation in direction of Magadino was followed by a decrease of the lake level. This was at about 204-207 m a.s.l. at the beginning of Holocene, at about 200 m a.s.l. during the Older Altantic, and at about 193-197 m a.s.l. during the Subboreal (fig. 6). The present lake level (193 m a.s.l.) was reached during the Subatlantic. Fig. 3: Periglacial landforms of the Cima di Gana Bianca massif. A ) Location of the studied rock glaciers and talus slopes. See figure 1 for geographical location. 1/ Intact rock glacier, 2/ Relict rock glacier,3/ Moraine ridge. 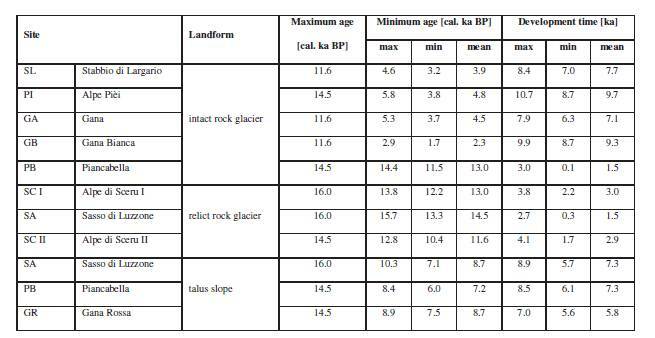 B) Maximum and minimum ages of the studied periglacial landforms (from Scapozza, 2013a). See table 3 for data. Holocene cold climate oscillations (from Burga et al., 2001): GH 8.2/Holocene Greenland stage 8.2 cal. ka BP, Pi/ Piora, Lö/ Löbben, Gö/Göschenen, LIA/ Little Ice Age. Chronozones: B/A/ Bølling/Allerød,YD/ Younger Dryas, PB/ Preboreal. See figure 1 for geographical location of boreholes. GIU 1 and MOL 1 are not reported here because they are not boreholes but excavations. Dating discussed in this work are marked in bold. Modified from Scapozza et al. (2012). 1/ Humus, 2/ Anthropogenic infilling, 3/ Gravel and sand, 4/ Sand, 5/ Silty sand, 6/ Silt, 7/ Organic material, 8/ Dated sample. Tab. 1: Radiocarbon dating and archaeological findings making it possible to calculate the sedimentation rates in the Ticino River alluvial plain. *According to the main stadials of deglaciation of the Ticino glacier. Sources:  Scapozza et al. (2014). Scapozza et al. (2012). Krebs & Antognini (2012). Oppizzi (1988). Ammann (1988). Krebs et al. (2015). Lodetti et al. (2005). Cardani Vergani (2014). Sormani (2012). Crivelli (1943). Scapozza & Oppizzi (2013). Donati (1969). Scapozza et al. (2015b). Fig. 5: Palaeogeography of the Ticino Valley after the deglaciation. See figure 1 for geographical location. Modified from Scapozza et al.(2012). Fig. 6: Palaeogeography of the lower Ticino Valley for three periods of the Holocene. See figure 1 for geographical location. Modified from Scapozza et al. (2012). 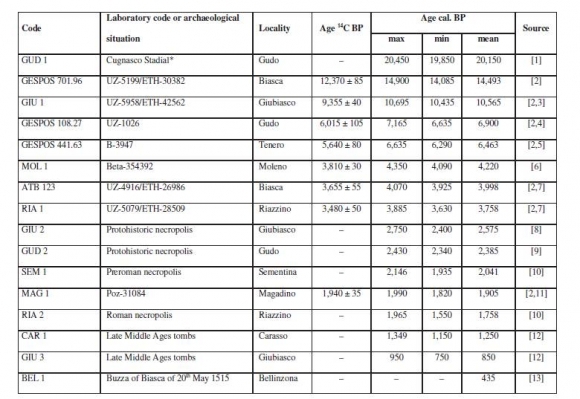 9Radiocarbon dating presented in tab. 1 were compiled and revised from previous works concerning the regional chronostratigraphy since the LGM (Scapozza et al., 2014) and the stratigraphy of the Ticino River floodplain (Scapozza et al., 2012), both described above. The analysis of historical sources (tab. 2), performed and discussed in detail by Scapozza (2013b) and Scapozza & Oppizzi (2013), allowed a precise determination of the position of the Ticino River mouth in Lake Maggiore since the Roman epoch. 10The development time of the talus slopes and rock glaciers of the Cima di Gana Bianca massif (fig. 3B and tab. 3) was calculated thanks to palaeogeographical reconstructions and Schmidt hammer exposure-age dating (SHD) performed by Scapozza (2013a). Palaeogeographical reconstructions makes it possible to calculate the maximum age of the landforms (i.e. the landforms are younger than), corresponding to the age of the last glacial stadial occupying the sector of development of the investigated rock glaciers and talus slopes. SHD allowed at the opposite the calculation of the minimum age of these landforms (i.e. the landforms are older than). 11The Schmidt hammer is a lightweight mechanical instrument allowing a rapid and non-destructive control of the quality of concrete based on the measurement of a rebound value (Schmidt, 1950). The a-dimensional rebound value (R-value) is proportional to the compression resistance of the rock surface and to the weathering degree of the rock sample, when assuming the same lithology and climate conditions, and lowers with increasing exposure times (McCarroll, 1989). By calibration with surface of known age, the R-values allow dating of the exposure-age of the rock surface (i.e. a minimal age of the surface) when considering the transport-related surface roughness of the measured rock sample (Shakesby et al., 2011). For the exact sampling technique adopted in this study, the rebound values measured and the calibration of the exposure-ages based on the rebound values measured on surfaces of known age, please refer to Scapozza (2015). Tab. 2: Historical so u rces making it possible to calculate the delta progradation rates in the Ticino river alluvial plain. Sources:  Scapozza (2013b). Broggini (1993). Solari (1982). Tab. 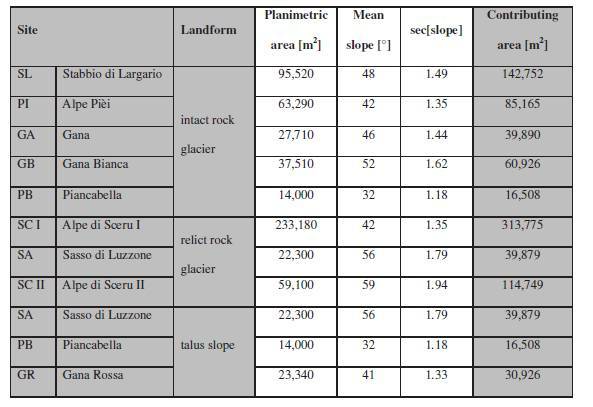 3: Maximum and minimum ages of the eleven periglacial landforms studied in Upper Ticino (Cima di Gana Bianca massif). Maximum age determined by palaeogeographical reconstructions and minimum age determined with SHD by Scapozza (2013a). See figure 3B for a graphical representation. 12Radiocarbon dates were calibrated using OxCal 4.2 software (Bronk Ramsey, 2009), in accordance with the IntCal13 calibration curve (Reimer et al., 2013), and with a 2σ confidence interval (95.4 % probability). 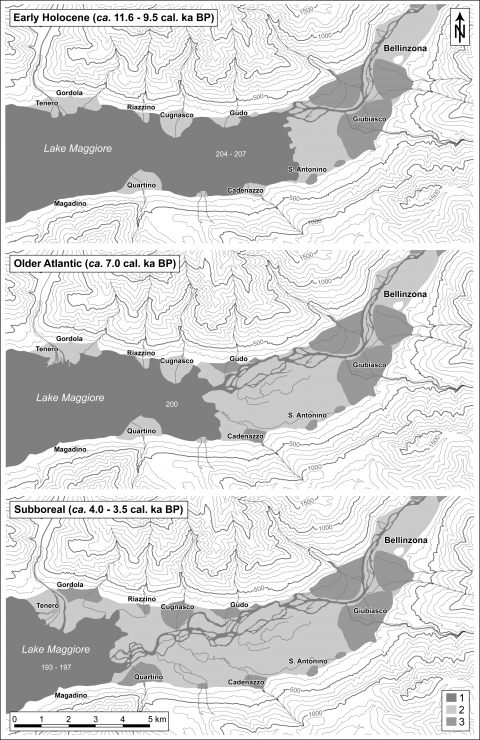 13Sedimentation rates in the Ticino River floodplain between Biasca and Lake Maggiore were determined thanks to the depth of sediment of known age at sixteen locations (tab. 1). 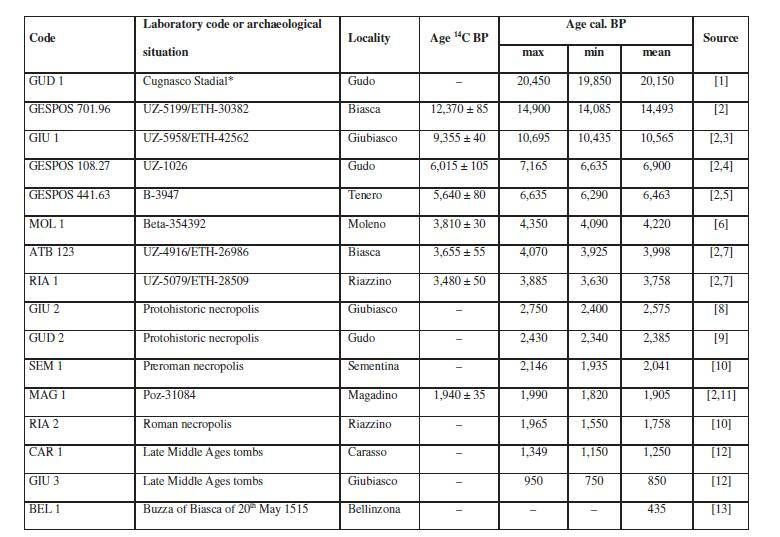 Data comes from: (1) radiocarbon dating of wood remains in six boreholes (fig. 4) and two excavations (samples GIU 1 and MOL 1); (2) seven archaeological findings in fluvial sediments for which is available a certain attribution to a precise epoch or a precise event (sample BEL 1, related with the historical event of 20th May 1515 known as Buzza di Biasca; Scapozza et al., 2015b); (3) the age of the Cugnasco stadial (see chap. 2.1). As seven dates come from archaeological findings, the well documented period is the Late Holocene, in particular the Subatlantic (2.6 cal. ka BP until today). 14A simple depth-age model was used, based on the depth of the dating and on their mean age. Age error was used for quantify the range between minimal and maximal values of sedimentation rate. Borehole stratigraphy data comes from the database GESPOS (GEstione, Sondaggi, POzzi e Sorgenti), managed by the Institute of Earth Sciences of the University of Applied Sciences and Arts of Southern Switzerland (IST-SUPSI). 15The Ticino River delta progradation rates were calculated thanks to the distance of the inferred palaeoposition of the delta front from the actual river mouth. The palaeopositions of the delta front were determined by an analysis of the position and depth of lacustrine, prodelta and fluvial sediments in boreholes of the GESPOS database or in an excavation (as it was the case for sample GIU 1). Five radiocarbon dating of wood remains within these sediments allowed the age of delta front position to be assessed for the period before the Roman epoch (GESPOS 701.96, GIU 1, GESPOS 108.27, RIA 2 and MAG 1; see tab. 1). The river mouth position since the Roman epoch was determined at five different moments thanks to historical sources (tab. 2), described and discussed in detail by Scapozza (2013b) and Scapozza and Oppizzi (2013). Sedimentological and historical data allowed a simple distance-age model of Ticino River delta progradation to be produced on the basis of the ten delta positions reconstructed. 16By knowing the volume of a talus slope or of a rock glacier, its maximum and minimum age, it is possible to calculate a mean erosion rate of the rockwalls located in the source of debris of the studied landforms. 19with: (V - v) = V * (1 – Φ); Φ = porosity (comprised the ice content). 24with: h = mean rockwall height [m], determined from the 20 m contour lines; d = planimetric distance [m] between the rock crest and the base of the rockwall, measured on a 1:25,000 topographical map; sec(α) = 1 * [cos(α)]-1. 25The contributing area with this approach is probably underestimated. Topographical heterogeneities of the rockwall and the area buried by the progressive talus slope aggradation were not considered in this calculation (Hinchliffe & Ballantyne, 1999). Moreover, the contributing area probably decreases with time by the erosion of the top of the rockwall. 28with: R = mean erosion rate [m.a-1]; Φ = porosity; a = talus slope planimetric surface [m2]; l = talus slope thickness [m]; A’ = planimetric contributing area [m2]; h = rockwall mean eight [m]; d = planimetric distance between the rock crest and the base of the rockwall [m]; t = time [a]. Total porosity for periglacial talus slopes of 40 %, including the volumetric fraction of ice, air or water, was estimated on the basis of well logging realised in similar landforms of the Swiss Alps (Scapozza et al., 2015a). Considering that periglacial talus slopes are not saturated with ice, this estimation was considered also for relict rock glacier, where the volumetric ice fraction is evidently replaced by air and water. 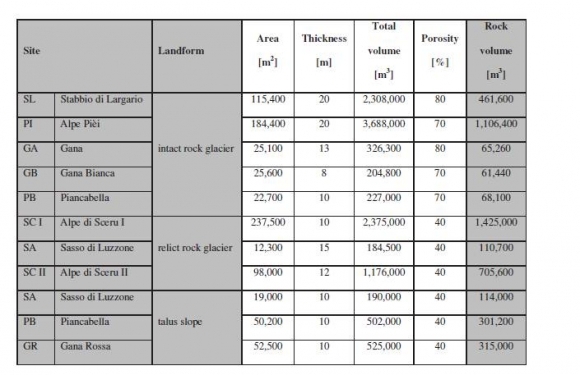 Estimations for intact rock glaciers were taken from typical values of total porosity for these landforms, considering a supersaturation in ice with ice content of 70–80 % (Scapozza et al., 2015a). 29Final values of R were finally transformed in metres by millennium [m.ka-1]. 30Thanks to dating compiled in tab. 1, it was possible to calculate the sedimentation rates based on the depth of the dated woods or archaeological findings (tab. 4). According to the maximum, minimum and mean ages determined from the dating ranges, were also calculated maximal, minimal and mean values for sedimentation rates. With the exception of the sedimentation rate determined for the Ticino River delta in Magadino since the Roman epoch (MAG 1), discussed in detail by Scapozza and Oppizzi (2013), the highest value concerns the entire infilling of the Ticino valley from the bedrock to the surface determined in Gudo (GUD 1). This value of about 5 m.ka-1 consider the whole period between the Cugnasco stadial and today. Considering that this value include the entire Lateglacial and Holocene, and that sedimentation rates for the Holocene are lower than 4.1 mm.a-1 (with mean values generally around 2.5 m.ka-1, as it is the case for example for ATB 123, RIA 1 and GUD 2), it is possible to observe that the sedimentation rates during the Lateglacial were higher than during the Holocene. Considering that the mean rate of 5.0 m.ka-1 determined in Gudo is much higher than the mean rate of 2.8 m.ka-1 determined in Biasca (borehole GESPOS 701.96) for the period between the beginning of the Bølling (14.5 cal. ka BP) and today, it is probable that the sedimentation rates were the highest during the Oldest Dryas (20.0-14.5 cal. ka BP). 31Sedimentation rates during the Holocene were variable. 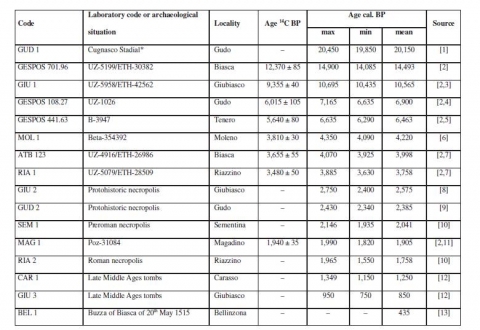 The lowest values were calculated, or for almost the entire Holocene (1.3 m.ka-1 for GIU 1), or over more than the four last millennia (1.6 m.ka-1 in borehole GESPOS 108.27, 1.8 m.ka-1 for an excavation in which was discovered the sample MOL 1, 2.2 m.ka-1 in borehole ATB 123 and 2.7 m.ka-1 for RIA 2), or in several archaeological findings (with values comprised between 0.2 and 2.6 m.ka-1, with the exception of GUD 2). For archaeological findings, we are clearly in presence of a bias due to the fact than necropolis and tombs are often located in the more distal parts of the floodplain or in fluvial terraces, making it possible their preservation during time. 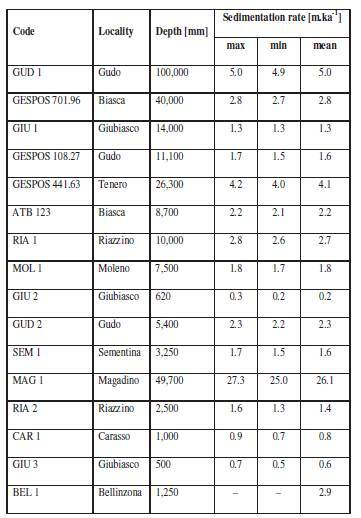 The value of 4.1 m.ka-1 determined in Tenero (borehole GESPOS 441.63) is not comparable with the others because we are here on the Verzasca delta. The Verzasca River has a regime more torrential than Ticino River, and the sedimentation occurs almost exclusively on the delta as the consequence of the important change on slope at the outlet of the Verzasca valley (as it is the case on an alluvial fan). 32A second-order polynomial model was adopted for compute the best-fitting statistical regression between sedimentation rates (fig. 7A). Archaeological findings and values determined on the Verzasca alluvial fan were not considered in this regression because the factors cited above. 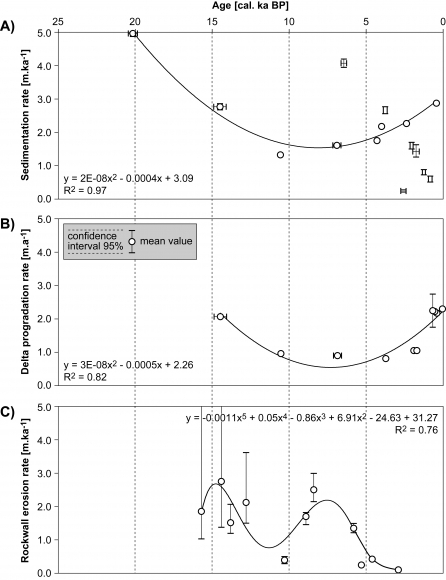 The correlation coefficient determined from the eight sedimentation rate values for the Ticino floodplain is very strong (R = 0.98), as indicated by the coefficient of determination (R2) of 0.97 reported in fig. 7A. Tab. 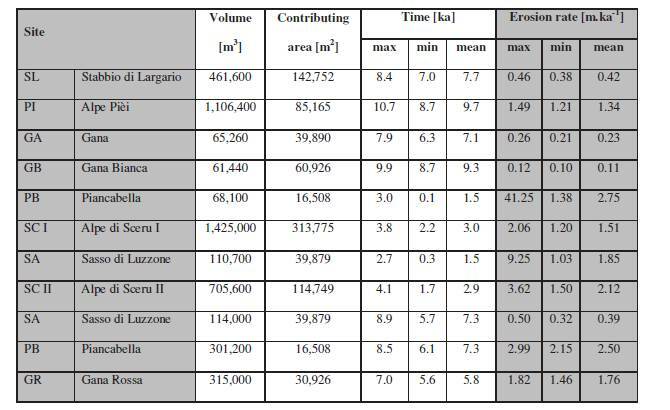 4: Sedimentation rates in the Ticino River floodplain. Calculated according to the ages presented in table 1. (A) Evolution with time of sedimentation rates in the Ticino River floodplain. (B) Evolution with time of Ticino River delta progradation rates. 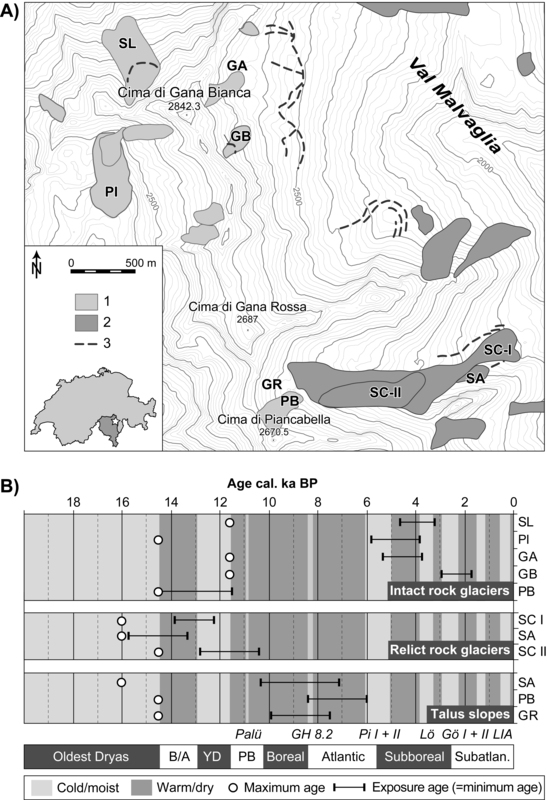 (C) Evolution with time of rockwall erosion rates determined from periglacial landforms of the Cima di Gana Bianca massif. 33Ticino River delta progradation rates during the Holocene are presented in tab. 5. Long-term values are comprised between 0.8 and 1.1 m.a-1 (with a mean for the whole Holocene of 1.0 m.a-1 based on GIU 1), indicating that the sedimentation during this period was less fluctuant with respect to the Lateglacial. The mean delta progradation rate between the beginning of the Bølling (14.5 cal. ka BP) and today was quite higher (2.1 m.a-1 for GESPOS 701.96), showing the same behaviour as sedimentation rates: this implies that delta progradation rates during the Lateglacial were higher than during the Holocene. The higher values (> 2.1 m.a-1) characterise the last six centuries. The highest progradation rate (2.3 m.a-1) was determined between 1850 AD and the present, and is more than the double with respect to the Holocene mean. Since 1850 AD, it is important to consider the important supply in sediments due to the catastrophic inundation of 1868 AD and the anthropogenic influence related to the river training performed in the second half of 19th century (Scapozza, 2013b; Scapozza & Oppizzi, 2013). 34As well as for sedimentation rates in the Ticino Valley, the best-fitting statistical regression computed for modelling delta progradation rates was polynomial of second order (fig. 7B). The coefficient of determination (R2 = 0.82) based on the 10 delta progradation rates quantified is strong. As a consequence, the correlation coefficient (R) of 0.91 between delta progradation rate and age is very strong. Tab. 5: Ticino River delta p rogradation rates during the Holocene. 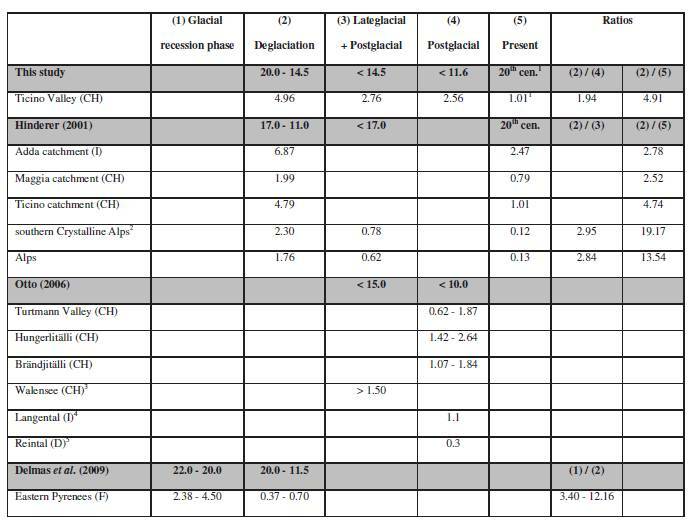 Calculated according to the radiocarbon ages reported in table 1, and the historical sources presented in table 2. 35Rockwall erosion rates based on the rock volume (tab. 6) and the contributing area (tab. 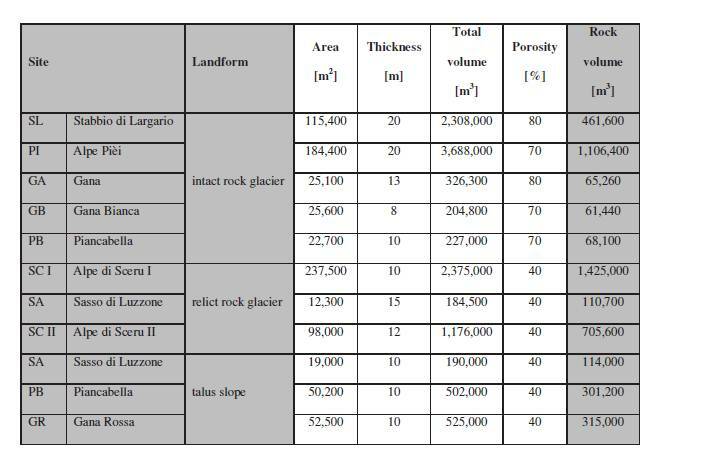 7) of eleven periglacial landforms (rock glaciers and talus slopes) were calculated for the Cima di Gana Bianca massif in the Upper Ticino catchment (fig. 3A). Considering also their time of development (fig. 3B and tab. 3), corresponding to the period between maximum and minimum age, it was possible to quantify rockwall erosion rates thanks to equation (4). 36Quantified rockwall erosion rates (tab. 8) shows enhanced rockwall erosion rates from the end of the Oldest Dryas to the beginning of the Bølling (15.5-12.8 cal. ka BP), as evidenced by the rock volume actually stocked in relict rock glaciers. These landforms developed relatively rapidly between the end of Oldest Dryas and the beginning of Holocene (fig. 3B), and their volumes indicates rockwall erosion rates ranged from 1.5 (SC I) to 2.1 (SC II) m.ka-1. 37Talus slope volumes indicate also enhanced rockwall erosion rates during part of the Boreal and the Atlantic (8.9-5.8 cal. ka BP). The surface age of these landforms indicates that erosion rates in the second half of Holocene were very low. As a consequence, the most part of the rock volume stocked within periglacial talus slopes of the Cima di Gana Bianca Massif was deposited between the end of the Lateglacial and the beginning of Holocene (Scapozza, 2013a, 2015). With the exception of SA, with a rockwall erosion ratio of 0.4 m.ka-1, rock volumes of PB and GR talus slopes indicates erosion rates comprised between 1.8 and 2.5 m.ka-1. 38Rockwall erosion rates during the Younger Dryas and the Preboreal (12.9-10.0 cal. ka BP) and during the second half of the Holocene since ca. 5.0 cal. ka BP, were below 1.0 m.ka-1. Rock volumes mobilised for Holocene values were assessed thanks to intact rock glaciers (fig. 3B). With the exception of PB, which developed completely during the Lateglacial, even if this landform is still intact (but with a rockwall erosion rate of 2.8 m.ka-1, which is typical for relict rock glacier), the other intact rock glaciers present values comprised between 0.11 (GB) and 1.3 (PI) m.ka-1, but in most cases lower than 1 m.ka-1, as it is the case for SL and GA (tab. 8). 39Summarising the results for landform categories, relict rock glaciers present mean rockwall erosion rate of 1.8 m.ka-1, which are slightly higher that mean values for talus slopes (1.5 m.ka-1) and almost the double of mean values for intact rock glaciers (1.0 m.ka-1; almost the triple if we do not consider PB rock glacier, without which the mean value for intact rock glaciers is of 0.5 m.ka-1), confirming their important role in mass wasting in the Alpine periglacial zone. 40A strong correlation coefficient (R = 0.87) between rockwall erosion rate and age was obtained only by a complex fifth-order polynomial model, with the resulting coefficient of determination (R2) that was of 0.76 (fig. 7C). This polynomial regression allowed the particular behaviour of rockwall erosion rate during time, with the two maxima at the end of the Oldest Dryas and at the beginning of the Bølling, and the minima corresponding with the Younger Dryas, to be modelled. Tab. 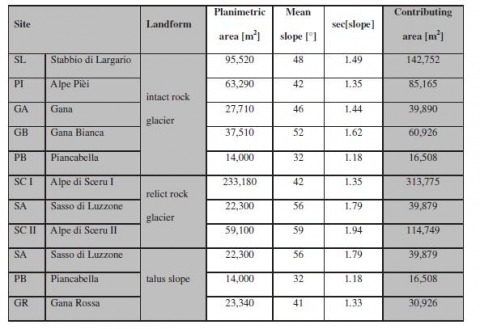 6: Total rock volume of the eleven periglacial landforms studied in Upper Ticino (Cima di Biana Bianca massif). Tab. 7: Contributing area for the eleven periglacial landforms studied in Upper Ticino (Cima di Gana Bianca massif). 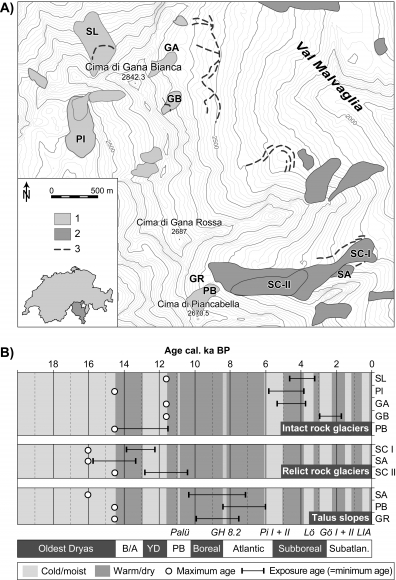 43Evolution with time of sedimentation rates in the Ticino Valley (fig. 7A) and progradation rates of the Ticino River delta (fig. 7B) are the highest at the beginning of deglaciation in the Oldest Dryas, present a decrease during the Lateglacial and the first part of the Holocene, and a new increase after the Mid-Holocene climate optimum (9.5-6.3 cal. ka BP according to Burga et al., 2001). Both sedimentation rates and delta progradation rates are very consistent with the model of paraglacial sedimentation proposed by Church and Ryder (1972) and improved by Ballantyne (2002). A similar behaviour with those of southern Swiss Alps was observed for example in northern Scotland (Hinchliffe & Ballantyne, 1999), were the paraglacial erosion was maximal during the Dimlington Stade (the Oldest Dryas equivalent for Central Europe), presents a gradual decrease during the Lateglacial Interstade (the Bølling/Allerød equivalent for Central Europe), for reaching values very similar with the Holocene mean already at the end of the Loch Lomond Stade (the Younger Dryas equivalent for Central Europe). 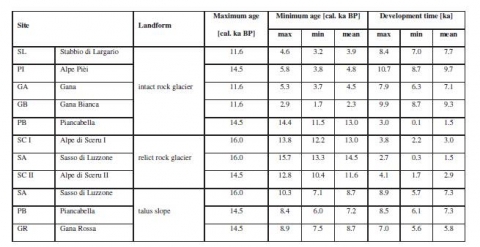 44Comparisons with a similar study in the southern Crystalline Alps (Hinderer, 2001) and other studies in the Alps (compiled by Otto, 2006) highlighted the significant high sedimentation rates during deglaciation compared to the Postglacial (tab. 9). The sedimentation rate in the Ticino Valley during the deglaciation quantified in this study (4.96 m.ka-1) is very similar with the value determined by Hinderer (2001) for the entire Ticino catchment (4.79 m.ka-1). Despite a non correspondence in the chronology of the deglaciation, assessed in this study by regional revision from Scapozza et al. (2014), but estimated by correlation with the Rhine glacier by Hinderer (2001), the similar sedimentation rate value can be explained by the similar time spans considered in the two studies: 5.5 ka for this study (from 20.0 to 14.5 cal. ka BP) and 6.0 ka for Hinderer (2001) (from 17.0 to 11.0 cal. ka BP) (tab. 9). 45The decrease in sedimentation from the deglaciation to the Postglacial cannot be directly compared. It is only possible to compare the ratio of 1.94 between deglaciation and Postglacial for the Ticino Valley (this study) with the ratio of 2.84-2.95 between deglaciation and Lateglacial+Postglacial for the entire Alps and the southern Crystalline Alps (Hinderer, 2001). The mean Postglacial value of 2.56 m.ka-1 determined in the Ticino Valley is higher than most of the values compiled by Otto (2006) for the last 10 ka (tab. 9). 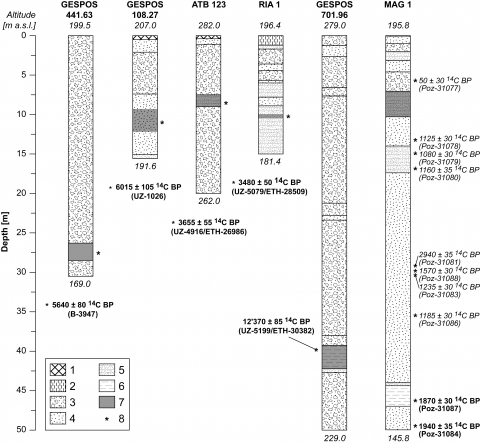 Regarding however the single sedimentation rates determined during Holocene (tab. 4), the values distribution from 0.2 and 2.7 m.ka-1 (with a mean value of 1.3 m.ka-1 for the entire Holocene for GIU 1) is more coherent with Postglacial sedimentation rates compiled by Otto (2006). 46It is nevertheless very difficult to make a comparison between different studies, because the temporal assessment is different. We quantified in this study time-constrained rates by a high resolution chronological assessment based on a compilation of radiocarbon dates. 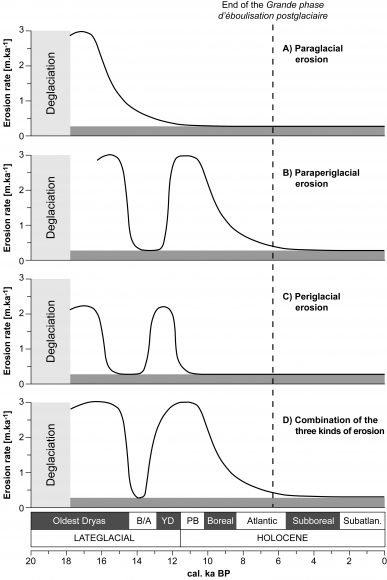 Evolution with time of sediment transfer is then time-assessed in the regional framework, which can vary from a region to another, in particular during the deglaciation. Sedimentation rates calculated by Hinderer (2011) are only partially time-constrained, because a wide chronology for the entire Alps, without an assessment of regional chronology of deglaciation and valley flood filling, is applied. Alpine denudation rates compiled and presented by Otto (2006) are finally not time-constrained. A fix time span of 10 ka is applied in most cases for the Postglacial, which is not coherent, neither with the period following the deglaciation (< 14.5 cal. ka BP), neither with the entire Holocene epoch (< 11.6 cal. ka BP). 47Evolution with time of rockwall erosion rates in higher Ticino (fig. 7C), at the opposite of sedimentation in the Ticino Valley floor, present the highest values in correspondence with periods of intense and rapid temperature warming, such as at the transition Oldest Dryas–Bølling and at the beginning of the Holocene (Blockley et al., 2012; Rasmussen et al., 2014). Between these two periods of enhanced rockfall, values for the Younger Dryas are very low and comparable with the Holocene mean. This result indicates that the severe periglacial conditions characterised by highly effective freeze-thaw activity during the Younger Dryas have had little influence on talus slope aggradation. This is the opposite of what has been shown by Ballantyne and Kirkbride (1987), which demonstrate that the Loch Lomond Stade (the Younger Dryas equivalent for Central Europe) was a period of highly effective rockfall activity in Upland Britain. Rockwall erosion rates for the Late Holocene are lower than 1.3 m.ka-1, with typical values around 0.5 m.ka-1, and reach a minimal value of 0.1 m.ka-1 for the last two millennia. These values are typical of denudation rates and rock wall retreat rates documented in other regions of the Alps for the Holocene (e.g. compilations from Sass & Wollny, 2001; Bertran, 2004; Otto, 2006). 48Considering that enhanced rockwall erosion rates during the transition Oldest Dryas–Bølling and at the beginning of the Holocene were determined in the periglacial zone, it is possible to make the hypotheses that they may be in relation with permafrost degradation in rockwalls by temperature warming (Gruber et al., 2004; Scapozza, 2013a). Considering in this case the permafrost degradation as the main controlling factor for enhanced rockwall erosion in the periglacial zone, it is possible to link this behaviour with the paraperiglacial sedimentation described by Mercier (2008). 49Enhanced rockwall erosion by paraperiglacial sedimentation was also evidenced in the Valais Alps by SHD of relict and intact rock glaciers and talus slopes (Scapozza, 2015). Rockwall erosion rates calculated by Scapozza (2013a) for three periglacial talus slopes indicates, during the first part of the Holocene (between 11.6 and 7.0 ± 1.2 cal. ka BP), values from 3 to 5.5 times higher than the Lateglacial (since the Bølling) and Postglacial mean (tab. 10). 50Enhanced rockwall erosion rates during the Lateglacial, in comparison with the Holocene were highlighted by several authors (e.g. Hinchliffe & Ballantyne, 1999; Sass & Wollny, 2001; Curry & Morris, 2004, and references therein). It is nevertheless very difficult to extrapolate the role of permafrost degradation from the general paraglacial sedimentation in talus slope aggradation, because these studies do not consider formation times shorter than the entire Lateglacial (or the part of Lateglacial since the deglaciation) or the entire Holocene, or time spans across these two periods. 51The consequence is that rockwall erosion rates obtained by a partially time-constrained approach (i.e. based only on the total time of development) are not comparable with “real” rockwall erosion rates obtained with the effective development time. 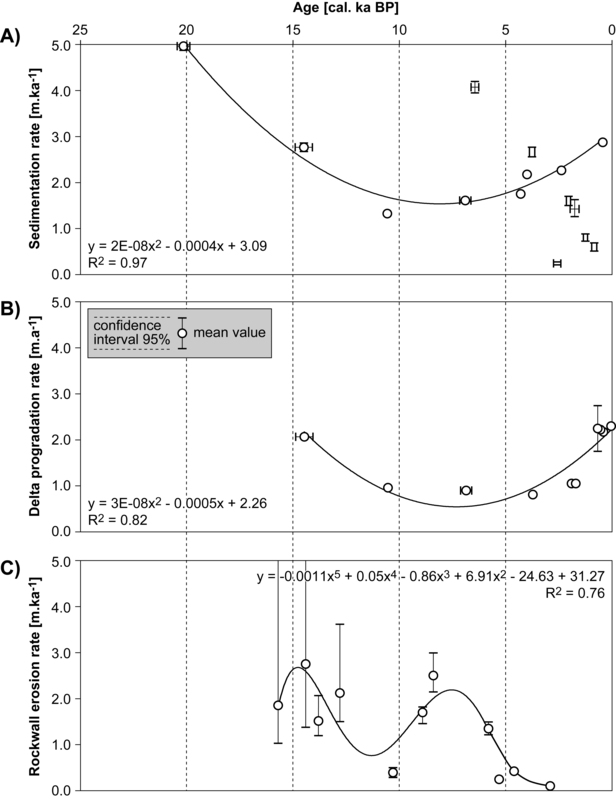 The evidence of paraperiglacial crisis is then possible exclusively by quantifying time-constrained rates based on the assessment of the development time of the studied landforms. Tab. 8: Rock wall erosion rates determined from the eleven periglacial landforms studied in Upper Ticino (Cima di Gana Bianca massif). Tab. 9 : Comparison of Alpine sedimentation rates [m.ka-1]. The different time periods [cal. 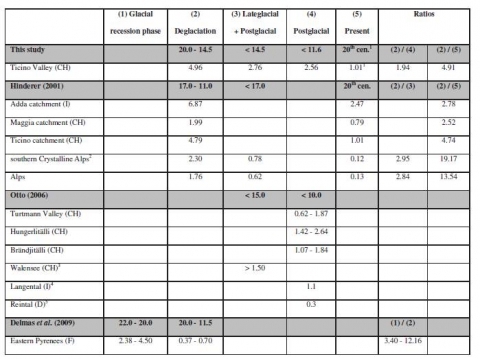 ka BP] adopted in each study are specified. 1Data from Hinderer (2001). 2Adda, Maggia and Ticino catchments. 3Data from Müller (1999). 4Data from Schrott & Adams (2002). 5Data from Hufschmidt (2002). Tab. 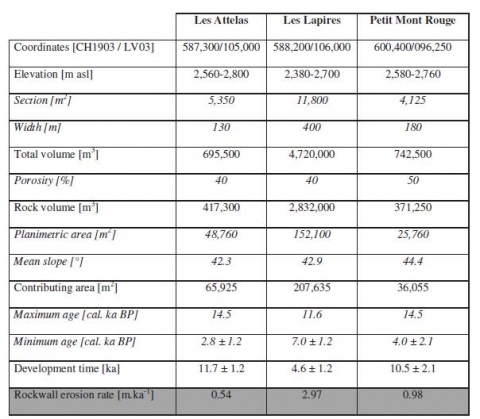 10: Rockwall erosion rates for three periglacial talus slopes of the Valais Alps. Fig. 8: Schematically model of the sediment transfer evolution in the Alpine realm during the Lateglacial and the Holocene. The grey band indicates the mean erosion/sedimentation rate during the second half of the Holocene. Inspired by Hinchliffe & Ballantyne (1999). B/A/ Bølling/Allerød, YD/ Younger Dryas, PB/ Preboreal. 52Paraglacial sedimentation model derived from observations on the Southern Swiss Alps (fig. 8A) highlights the enhanced geomorphological activity in freshly deglaciated regions, as it was the case for the Ticino Valley during the Oldest Dryas. They characterise the entire period of paraglacial adjustment, probably by the relation with postglacial slope debuttressing (Ambrosi & Crosta, 2011), a rise of hydrostatic pressure in cracks by increase of liquid water availability (Bertran, 2004), and the significant sedimentary reworking along slopes without arborescent vegetation, as it was the case in the Ticino Valley during the Lateglacial. 53Considering that deglaciation of the Ticino Valley ended at ca. 20.0 cal. ka BP, there is a certain delay in the paraglacial exhaustion, typical of major valleys in comparison to uplands (Church & Slaymaker, 1989). During a glaciation, major valleys are typically located in the ablation zone of Alpine glaciers. Primary subaerial denudation rates at the beginning of the deglaciation are then lower in comparison with the high valleys, located in the accumulation zone of Alpine glaciers and then subject to glacial erosion. This was described for example by an assessment of glacial erosion rates in Eastern Pyrenees (Delmas et al., 2009), indicating a significant decrease in sedimentation rates from the glacial recession phase to the deglaciation (tab. 9). Time-constrained rates highlighted a peak of geomorphic activity during the main transition to ice-free conditions, typical of uplands subject to glacial erosion. The extent of the paraglacial period shifts in time from uplands to lowlands, due to the paraglacial sediment storage accumulation in lowlands at the same time of paraglacial erosion of glacial sediments in the upper valleys (Ballantyne, 2002). 54For the paraperiglacial erosion, the model derived from observations in the Cima di Gana Bianca Massif (fig. 8B) indicates that it is probably combined with paraglacial erosion for the Oldest Dryas. For the beginning of Holocene, however, enhanced rockwall erosion aggrading periglacial talus slopes indicates that paraperiglacial erosion constituted probably the main source of sediments in the periglacial zone. 55The classical periglacial erosion (fig. 8C), traditionally linked with gelifraction during cold periods as the Oldest Dryas (or the Scottish equivalent Dimlington Stade, e.g. Hinchliffe & Ballantyne, 1999) and the Younger Dryas (or the Scottish equivalent Loch Lomond Stade, e.g. Ballantyne & Kirkbride, 1987), seems not to be a main component of the rockwall erosion highlighted in Upper Ticino, because erosion/sedimentation rates during the Younger Dryas were comparable with mean Holocene values (ca. 1.0 m.ka-1). 56Considering the empirical data presented here, it is probable that the real behaviour of sediment transfer from source to sink (i.e. from the periglacial zone in Upper Ticino to the Ticino Valley and delta) is based on a combination of paraglacial and paraperiglacial erosion (fig. 8D). This combination explain straightforwardly the enhanced rockwall erosion rates highlighted for the end of the Oldest Dryas and the beginning of the Bølling between 15.5 and 12.8 cal. ka BP, and for the Early Holocene between 8.9 and 5.8 cal. ka BP. 581- The Lateglacial was characterised by the highest erosion/sedimentation rates (more than 2 m.ka-1), by the combination of paraglacial erosion just after the beginning of the deglaciation (between 20.0 and 15.5 cal. ka BP in the Ticino Valley) and paraperiglacial erosion during the first important temperature warming phase, occurred during the Bølling. The paraglacial erosion phase took place during 6-8 millennia, and was almost totally concluded at the end of the Pleistocene. The first phase of paraperiglacial erosion taking place during the Bølling/Allerød was driven by significant permafrost degradation in rockwalls conducing to the formation of actually relict rock glaciers, which are larger than intact ones. 592- A second phase of paraperiglacial erosion takes place during the second important temperature warming phase, occurred at the beginning of the Holocene and driving an enhanced erosion phase in the periglacial zone (with erosion rates higher than 2.0 m.ka-1) until the end of the mid-Holocene climate optimum. Then end of the second phase of paraperiglacial erosion probably correspond to the Grande phase d’éboulisation postglaciaire (litt. “Big phase of postglacial erosion”) described in the Southern French Alps by Jorda and Rosique (1994) and characterising the long period of enhanced sediment transfer following the deglaciation. During this second phase of paraperiglacial erosion were formed the main part of periglacial talus slopes and were released deposits that will constitute intact rock glaciers in the followings millennia. 603- During the second half of the Holocene (i.e. after the end of the mid-Holocene climate optimum), sedimentation rates in the lowlands increase, as highlighted by sedimentation rates in the Ticino Valley and Ticino River delta progradation rates, presenting values similar with those of the end of the Lateglacial. 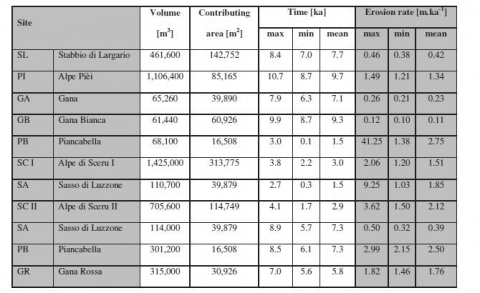 Rockwall erosion rates in the periglacial zones, otherwise, are lower than 0.5 m.ka-1 and reach a minimal value of 0.1 m.ka-1 for the last two millennia, as documented in other regions of the Alps (e.g. Sass & Wollny, 2001, Bertran, 2004, Otto, 2006). 61Sediment transfer behaviour since the deglaciation and until the end of the mid-Holocene climate optimum may then be explained by a combination of a paraglacial erosion phase related to the deglaciation and of two paraperiglacial phases related with periods of significant temperature warming, such as during the Bølling/Allerød and the first part of the Holocene. For the second part of the Holocene, otherwise, the increase in sedimentation rates in the valley floor is probably explained by the general glacial advance characterizing the six cold phases registered in Central Europe since 6.2 cal. ka BP (Burga et al., 2001; Wanner et al., 2008). For the periglacial zone, this period was at the opposite characterized by low rockwall erosion rates related to limited permafrost degradation at least until the end of the Little Ice Age. Ambrosi C. & Crosta G.B., 2011 - Valley shape influence on deformation mechanisms of rock slopes. In M. Jaboyedoff (ed. ), Slope tectonics. Special publication - Geological Society of London, 351. Geological Society, London, 215-233. Ammann P., 1988 - Ritrovamento di antichi legni nel sottosuolo di Tenero. Bollettino della Società Ticinese di Scienze Naturali, 76, 47-50. André M.-F., 1997 - Holocene rockwall retreat in Svalbard: a triple-rate evolution. Earth Surface Processes and Landforms, 22 (5), 423-440. André M.-F., 2009 - From climatic to global change geomorphology: contemporary shifts in periglacial geomorphology In J. Knight & S. Harrison (eds. ), Periglacial and Paraglacial Processes and Environments. Special publication - Geological Society of London, 320. Geological Society, London, 5-28. Ballantyne C.K., 2002 - Paraglacial geomorphology. Quaternary Science Reviews, 21 (18-19), 1935-2017. Ballantyne C.K., 2008 - After the Ice: Holocene geomorphic activity in the Scottish Highlands. Scottish Geographical Journal, 124 (1), 8-52. Ballantyne C.K. & Kirkbride M.P., 1987 - Rockfall activity in upland Britain during the Loch Lomond Stadial. The Geographical Journal, 153 (1), 86-92. Beatrizotti G., 1985 - La geodinamica ed il suo impatto sull’uomo. Bollettino della Società Ticinese di Scienze naturali, 73, 31-36. Bertran P., 2004 - Dépôts de pente continentaux. Dynamique et faciès. Quaternaire, HS 1, 1-259. Blockley S.P.E., Lane C.S., Hardiman M., Rasmussen S.O., Seierstad I.K., Steffensen J.P., Svensson A., Lotter A.F., Turney C.S.M., Bronk Ramsey C. & INTIMATE members, 2012 - Synchronisation of palaeoenvironmental records over the last 60,000 years, and an extended INTIMATE event stratigraphy to 48,000 b2k. Quaternary Science Reviews, 36, 2-10. Broggini R., 1993 - Magadino 1843–1993. Tipografia Poncioni, Losone, 262 p.
Bronk Ramsey C., 2009 - Bayesian analysis of radiocarbon dates. Radiocarbon, 51 (1), 337-360. Cardani Vergani R., 2014 - Ricerche archeologiche in Cantone Ticino nel 2013. Bollettino Associazione Archeologica Ticinese, 26, 28-33. Church M. & Ryder J.M., 1972 - Paraglacial sedimentation: a consideration of fluvial processes conditioned by glaciations. Geological Society of America Bulletin, 83 (10), 3059-3072. Church M. & Slaymaker O., 1989 - Disequilibrium of Holocene sediment yield in glaciated British Columbia. Nature, 337 (6206), 452-454. Cossart É., Mercier D., DecaulNe A. & Feuillet T., 2013 - An overview of the consequences of paraglacial landsliding on deglaciated mountain slopes: typology, timing and contribution to cascading fluxes. Quaternaire, 24 (1), 13-24. Crivelli A., 1943 - Atlante preistorico e storico della Svizzera Italiana. Vol. 1: Dalle origini alla civiltà romana. Istituto Editoriale Ticinese, Bellinzona, 153 p.
Curry A.M., 2000 - Observations on the distribution of paraglacial reworking of glacigenic drift in western Norway. Norsk Geografisk Tidsskrift, 54 (4), 139-147. Curry A.M. & Morris C.J., 2004 - Lateglacial and Holocene talus slope development and rockwall retreat on Mynydd Du, UK. Geomorphology, 58 (1-4), 85-106. Delmas M., Calvet M. & Gunnell Y., 2009 - Variability of Quaternary glacial erosion rates – A global perspective with special reference to the Eastern Pyrenees. Quaternary Science Reviews, 28 (5-6), 484-498. Donati P., 1969 - Notiziario archeologico ticinese 1968. Bollettino Storico della Svizzera italiana, 81, 50-78. 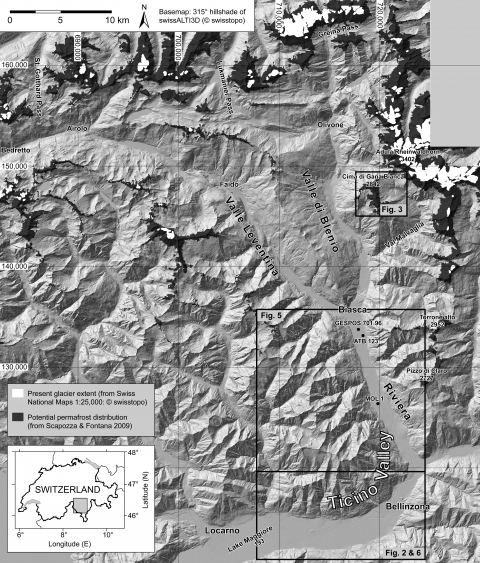 Gruber S., Hoelzle M. & Haeberli W., 2004 - Permafrost thaw and destabilization of Alpine rock walls in the hot summer of 2003. Geophysical Research Letters, 31, L13504, doi:10.1029/2004GL020051. Hinchliffe S. & Ballantyne C.K., 1999 - Talus accumulation and rockwall retreat, Trotternish, Isle of Skye, Scotland. Scottish Geographical Journal, 115 (1), 53-70. Hinderer M., 2001 - Late Quaternary denudation of the Alps, valley and lake fillings and modern river loads. Geodinamica Acta, 14 (4), 231-263. Hufschmidt G., 2002 - GIS-gestützte Modellierung von Sedimentspeichern als Komponenten eines alpinen Geosystems (Reintal, Bayrische Alpen). Diplomarbeit, Rheinische Friedrich-Wilhelms-Universität Bonn, Bonn, 106 p.
Jorda M. & Rosique T., 1994 - Le Tardiglaciaire des Alpes françaises du Sud : Rythme et modalités des changements bio-morphoclimatiques. Quaternaire, 5 (3), 141-149. Krebs P. & Antognini M., 2012 - Rinvenimento a Giubiasco di un tronco di pino silvestre risalente all’inizio dell’Olocene. Bollettino della Società Ticinese di Scienze Naturali, 100, 53-63. 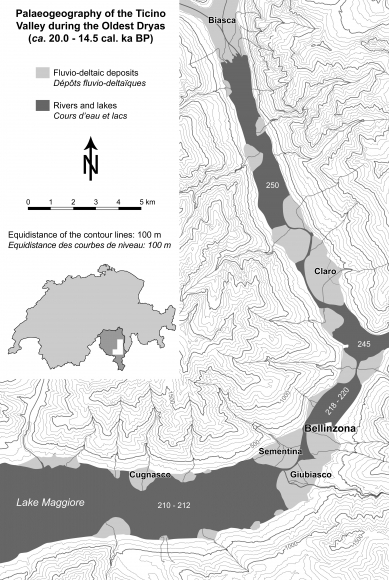 Krebs P., Biondina D., Bonardi M. & Bertogliati M., 2015 - Rinvenimento a Moleno nella Svizzera sudalpina di un tronco di quercia vecchio di oltre quattro millenni. Bollettino della Società Ticinese di Scienze Naturali, 103, 53-56. Lodetti F., Hohl A. & Antognini M., 2005 - Nota breve sul rinvenimento di frammenti di legno in due sondaggi geotecnici presso Biasca e Riazzino. Bollettino della Società Ticinese di Scienze Naturali, 93, 91-95. McCarroll D., 1989 - Potential and limitations of the Schmidt Hammer for relative-age dating: field tests on Neoglacial moraines, Jotunheimen, Southern Norway. Arctic and Alpine Research, 21 (3), 268-275. McCarroll D., Shakesby R.A. & Matthews J.A., 2001 - Enhanced rockfall activity during the Little Ice Age: further lichenometric evidence from a Norwegian talus. Permafrost and Periglacial Processes, 12 (2), 157-164. Mercier D., 2008 - Paraglacial and paraperiglacial landsystems: concepts, temporal scales and spatial distribution. Géomorphologie : Relief, Processus, Environnement, 14 (4), 223-233. Mercier D., Étienne S., Sellier D. & André M.-F., 2009 - Paraglacial gullying of sediment-mantled slopes: a case study of Colletthøgda, Kongsfjorden area, West Spitsbergen (Svalbard). Earth Surface Processes and Landforms, 34 (13), 1772-1789. Müller B.U., 1999 - Paraglacial sedimentation and denudation processes in an Alpine valley of Switzerland. An approach to the quantification of sediment budgets. Geodinamica Acta, 12 (5), 291-301. Oppizzi P., 1988 - Ritrovamenti di frammenti di legno in una perforazione sul territorio del comune di Gudo. Bollettino della Società Ticinese di Scienze Naturali, 76, 51-53. OTTO J.-P., 2006 - Paraglacial sediment storage quantification in the Turtmann Valley, Swiss Alps. Dissertation zur Erlangung des Doktorgrades, Rheinische Friedrich-Wilhelms-Universität Bonn, Bonn, 160 p.
Rasmussen S.O., Bigler M., Blockley S.P., Blunier T., BucharDT S.L., Clausen H.B., Cvijanovic I., Dahl-Jensen D., Johnsen S.J., Fischer H., Gkinis V., Guillevic M., Hoek W.Z., Lowe J., Pedro J.B., Popp T., Seierstad I.K., Steffensen J.P., Svensson A.M., Vallelonga P., Vinther B.M., Walker M.J.C., Wheatley J.J. & Winstrup M., 2014 - A stratigraphic framework for abrupt climatic changes during the Last Glacial period based on three synchronized Greenland ice-core records: refining and extending the INTIMATE event stratigraphy. Quaternary Science Reviews, 106, 14-28. Reimer P.J., Bard É., Bayliss A., Beck J.W., Blackwell P.G., Bronk Ramsey C., Buck C.E., Cheng H., Edwards R.L., Friedrich M., Grootes P.M., Guilderson T.P., Haflidason H., Hajdas I., Hatté C., Heaton T.J., Hoffmann D.L., Hogg A.G., Hughen K.A., Kaiser K.F., Kromer B., Manning S.W., Niu M., Reimer R.W., Richards D.A., Scott E.M., Southon J.R., Staff R.A., Turney C.S.M. 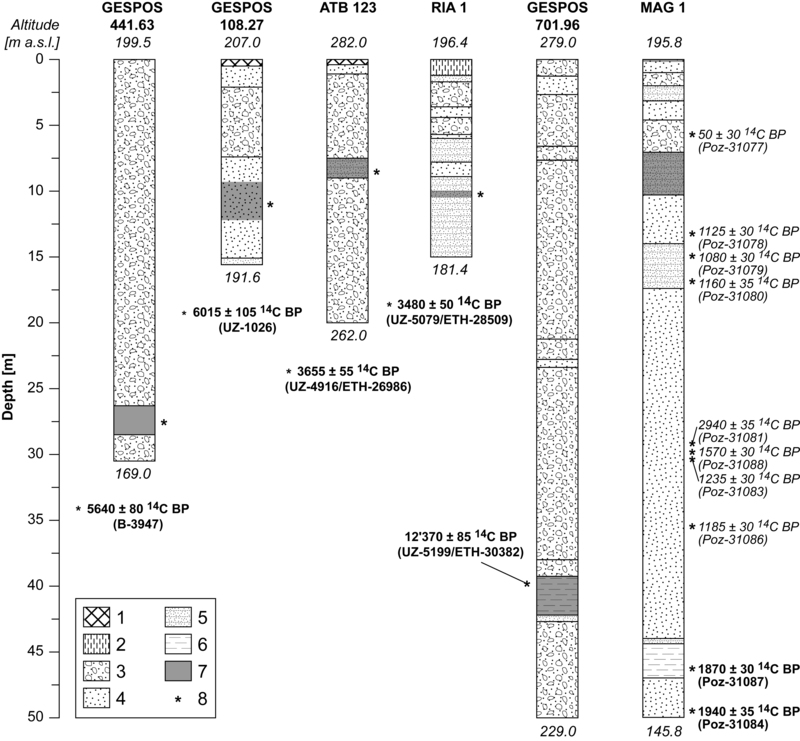 & van der Plicht J., 2013 - IntCal13 and Marine13 radiocarbon age calibration curves, 0–50,000 years cal BP. Radiocarbon, 55 (4), 1869-1887. Sass O. & Wollny K., 2001 - Investigations regarding alpine talus slopes using ground penetrating radar (GPR) in the Bavarian Alps, Germany. Earth Surface Processes and Landforms, 26 (10), 1071-1086. SCAPOZZA C., 2013a - Stratigraphie, morphodynamique, paléoenvironnements des terrains sédimentaires meubles à forte déclivité du domaine périglaciaire alpin. Géovisions, 40. Thèse de Doctorat, Université de Lausanne, Lausanne, 551 p.
Scapozza C., 2013b - L’evoluzione degli ambienti fluviali del Piano di Magadino dall’anno 1000 a oggi. Archivio Storico Ticinese, 153, 60-92. Scapozza C., 2015 - Evolution des glaciers et du pergélisol depuis le Dernier Maximum Glaciaire dans la région du Mont Gelé-Mont Fort (Alpes valaisannes, Suisse) : chronologie, modalités de la dernière déglaciation et datations des âges d’exposition à l’aide du marteau de Schmidt. Quaternaire, 26 (2), 141-172. Scapozza C. & Ambrosi C., in press - Between glaciers, rivers and lakes: the geomorphological landscapes of Tessin. In E. Reynard (ed. ), Landscapes and Landforms of Switzerland. Springer, Dordrecht. Scapozza C. & Oppizzi P., 2013 - Evolution morpho-sédimentaire et paléo-environnementale de la plaine fluvio-deltaïque du Ticino pendant l’Holocène récent (Canton du Tessin, Suisse). Géomorphologie : Relief, Processus, Environnement, 19 (3), 265-286. 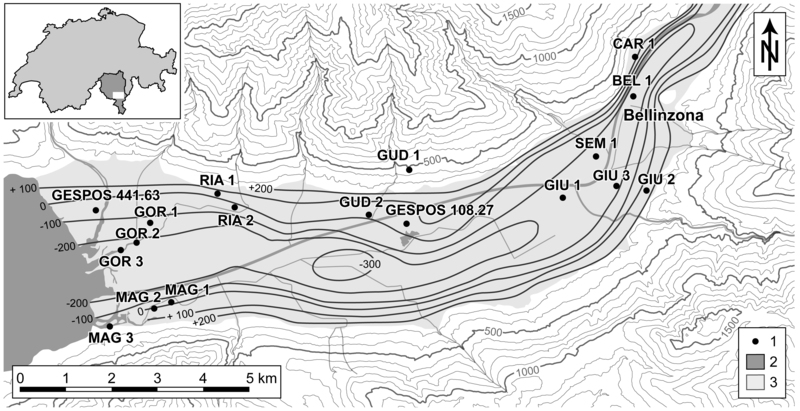 Scapozza C., Gex P., Lambiel C. & Reynard E., 2008 - Contribution of self-potential (SP) measurements in the study of alpine periglacial landforms: examples from the southern Swiss Alps. In D.L. Kane & K.M. Hinkel (eds. ), NICOP 2008: Ninth International Conference on Permafrost, Volume 2. Proceedings of the Ninth International Conference on Permafrost, University of Alaska, Fairbanks, June 29–July 3, 2008. Institute of Northern Engineering, University of Alaska, Fairbanks, 1583-1588. Scapozza C., Lambiel C., Gex P. & Reynard E., 2011 - Prospection géophysique multi-méthodes du pergélisol alpin dans le sud des Alpes suisses. Géomorphologie : Relief, Processus, Environnement, 17 (1), 15-32. Scapozza C., Antognini M., Oppizzi P. & Patocchi N., 2012 - Stratigrafia, morfodinamica, paleoambienti della piana fluvio-deltizia del Ticino dall’Ultimo Massimo Glaciale a oggi: proposta di sintesi. Bollettino della Società Ticinese di Scienze Naturali, 100, 89-106. Scapozza C., Castelletti C., Soma L., Dall’Agnolo S. & Ambrosi C., 2014 - Timing of LGM and deglaciation in the Southern Swiss Alps. Géomorphologie : Relief, Processus, Environnement, 20 (4), 307-322. Scapozza C., Baron L. & Lambiel C., 2015a - Borehole logging in Alpine periglacial talus slopes (Valais, Swiss Alps). Permafrost and Periglacial Processes, 26 (1), 67-83. Scapozza C., Tognacca C., Ambrosi C. & Seno S., 2015b - 20 maggio 1515: la “Buzza” che impressionò l’Europa. Bollettino della Società Ticinese di Scienze naturali, 103, 79-88. Schmidt E., 1950 - Der Beton-Prüfhammer: Ein Gerät zur Bestimmung der Qualität des Betons im Bauwerk. Schweizerische Bauzeitung, 68 (28), 378-379. Schrott L. & Adams T., 2002 - Quantifying sediment storage and Holocene denudation in an Alpine basin, Dolomites, Italy. Zeitschrift für Geomorphologie. Supplementband, 128, 129-145. Schrott L., Götz J., Geilhausen M. & Morche D., 2006 - Spatial and temporal variability of sediment transfer and storage in an Alpine basin (Reintal valley, Bavarian Alps, Germany). Geographica Helvetica, 61, 191-200. Slaymaker O., 2009 - Proglacial, periglacial or paraglacial? In J. Knight & S. Harrison (eds. ), Periglacial and Paraglacial Processes and Environments. Special publication - Geological Society of London, 320. Geological Society, London, 71-84. Solari R., 1982 - La Bonifica del Piano di Magadino. Consorzio per la bonifica del Piano di Magadino, Bellinzona, 125 p.
Sormani M.A., 2012 - La necropoli protostorica di Gudo - Canton Ticino: dall’epoca del Bronzo alla seconda età del Ferro. Rivista Archeologica dell'Antica Provincia e Diocesi di Como, 193-194, 5-159. Thorn C.E. & LoEwenherz D.S., 1987 - Spatial and temporal trends in alpine periglacial studies: implications for paleo reconstructions. In J. Boardman (ed. ), Periglacial processes and landforms in Britain and Ireland. Cambridge University Press, Cambridge, 57-65. Wanner H., Beer J., BÜtikofer J., Crowley T.J., Cubasch U., FlÜckiger J., Goosse H., Grosjean M., Joos F., Kaplan J.O., KÜttel M., MÜller S.A., Prentice I.C., Solomina O., Stocker T.F., Tarasov P., Wagner M. & Widmann M., 2008 - Mid- to late Holocene climate change: an overview. Quaternary Science Reviews, 27 (19-20), 1791-1828. Cristian Scapozza, « Evidence of paraglacial and paraperiglacial crisis in Alpine sediment transfer since the last glaciation (Ticino, Switzerland) », Quaternaire, vol. 27/2 | 2016, 139-155.